Richmond real estate’s best riverfront property value is now here! 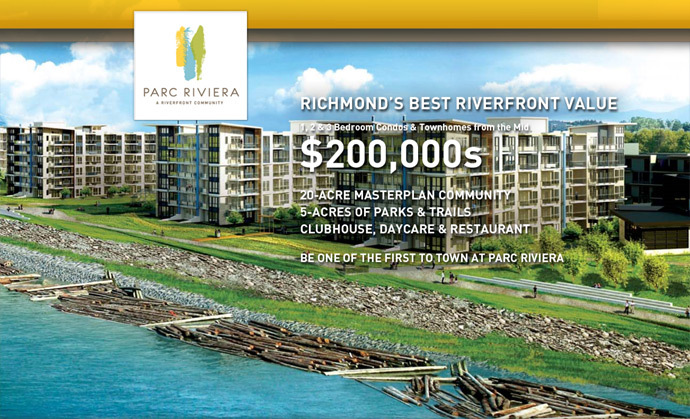 Introducing the exciting Parc Riviera riverfront condos in Richmond BC where you will find a twenty acre master planned community with five acres of parks and riverfront trails, just for you! From the new Richmond Parc Riviera Clubhouse to the Daycare and restaurant, this masterplanned neighbourhood will be your last shot at owning along the beautiful Richmond riverfront real estate district. In addition, owning will be easy, as the pre-construction Richmond Parc Riviera condo pricing will likely start from the mid $200,000’s making it the most affordable riverfront Richmond condo project on the market, and likely the last! The limited introductory pre-construction pricing won’t last, and will likely end after the grand opening launch for VIP registrants. The new Richmond Parc Riviera condos will introduce one, two and three bedroom riverfront condos in addition to a boutique collection of pre-construction Richmond Parc Riviera townhomes. By one of the first to own at Parc Riveria Richmond BC, a Riverfront Community unmatched by any other Greater Vancouver development. The well planned and designed neighbourhood is brought to you through the collaboration of DAVA Developments and ORIS Consulting, both experienced and well established builders and designers. The presentation centre for the new Richmond Parc Riviera condos for sale will be located at 10111 River Drive Richmond BC. For early VIP registration, please visit www.parcriviera.com or call 604.231.5900. They also have a Facebook and Twitter social media marketing platforms launched. Parc Riviera is located in North Richmond BC, a cosmopolitan urban community that surrounds its residents with the natural world. A community with it all, Parc Riviera condos in Richmond are close to work, friends, family, and the neighbourhood you k now and love. And its parks, gardens and trails let you walk the dog, exercise and spend time with your family without ever leaving home. The Parc Riviera condos in Richmond riverfront district is all about 3 things: Convenient. Location. Natural. For VIP Access, please register on our blog page! We are excited to share with you new information on this 20-acre masterplanned Parc Riviera Richmond riverfront community. Exceptional Richmond Riverfront Condos and Townhomes from the mid $200,000s > With new Richmond Parc Riviera condos and townhomes starting in the mid $200,000s, a riverfront location with views to the North Shore and over 5 acres of park and amenity space, Parc Riviera is truly an extraordinary community. Get in Early – Don’t Miss Out! This is your opportunity to participate in our pre-construction Richmond Parc Riviera VIP Registrant Preview Event at our new Presentation Centre to learn more about Parc Riviera condo’s first release and special sales incentives. Refreshments will be provided by the award-winning Jade Seafood Restaurant on Thursday, Sept. 15 between 6pm – 8pm. Here’s a quick list of the outdoor spaces here at Parc Riviera Richmond riverfront community: outdoor space/balconies/patios are available in each and every floor plan to maximize liveable space and surrounding the neighbourhood is over five acres of parkland and open green space. There are also over 4,000 ft of dyke trails for walking and biking just seconds outside your front door at the pre-construction Richmond Parc Riviera condos and riverfront townhouse development in addition to interconnected walkways and beautifully landscaped and professionally maintained grounds. The Parc Riviera condos in Richmond will also feature a children’s playground, family picnic areas, extensive clubhouse amenities, lap pool, hot tub, fitness centre, an owner’s lounge in addition to a five thousand square foot daycare center. The riverfront Richmond Parc Riviera condos will also have space for future restaurant and retail boutiques. 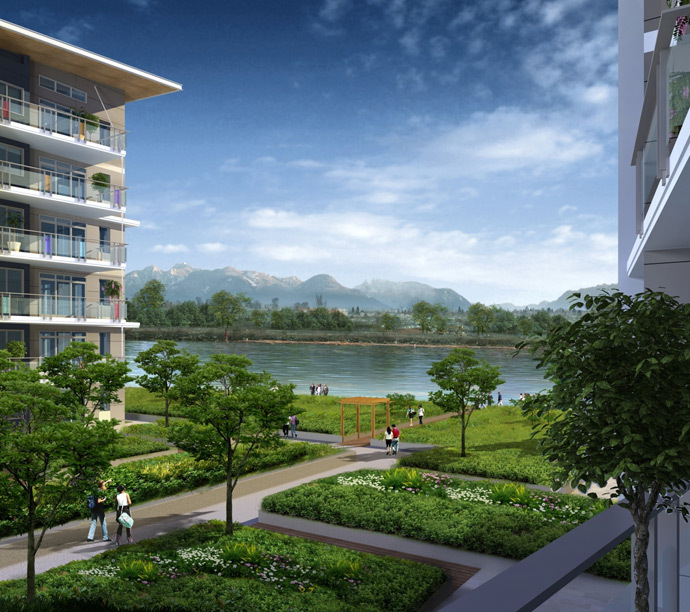 A vibrant urban retreat in a naturally contemporary setting, the new Parc Riviera condos in Richmond BC is the last great ground level opportunity to own riverfront property in the Lower Mainland at a reasonable cost. With a river flooring before you, and the city behind you, the new Richmond Parc Riviera community takes everything you love about urban city dwelling living and weaves it into a twenty acre park neighbourhood along the beautiful and mighty Fraser River. The pre-construction Richmond Parc Riviera condos for sale is an exclusive collection of apartment homes and multi-level townhomes where you can live, work and play, with new Richmond homes for sale that will suite every family’s lifestyle and budget. A community with it all, the Parc Riviera condos in Richmond real estate market is close to work, friends, family and the community you know and love. 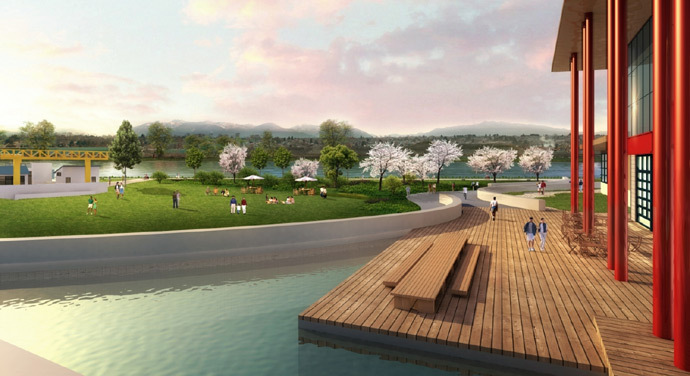 And the riverfront Richmond property development will have tonnes of parks, gardens, and trails for your dog, walking, exercising and spending time with your family without ever leaving home. The lifestyle choices at the riverfront Richmond Parc Riviera condos and townhomes are plentiful with an easy and close commute of just ten minutes to the SkyTrain station and only minutes to all that Richmond BC has to offer. In addition, the riverfront Parc Riviera condos in Richmond will feature your own private retreat with on site amenities as you can enjoy the beautiful oasis or jump in the hot tub or lap pool after work. As far as the new riverfront Richmond Parc Riviera community has to offer, think about an onsite daycare (for great convenience to couples and families) in addition to children’s play areas, playgrounds, restaurants, retail stores in the community and grocers and community gardens. Also available are live performances at the Pump Station Stage. As far as nature is concerned, the new Parc Riviera Richmond riverfront condos for sale will include over four thousand feet of riverfront dyke trails for you to enjoy in addition to five acres of parks and green spaces. There are water features and ponds, professional landscaped, sunsets along the dyke trails and great views of the riverside and North Shore mountains. Parc Riviera Townhomes and Condos in Richmond have been created to maximize space, light and connectivity to the natural world around them. The beautiful Richmond apartments for sale are architecturally stepped from four to six storeys to maximize everyone’s river views, let in natural light and to create natural openness to each suite. The two level new Richmond Parc Rivieria townhouses are set along pedestrian friendly River Drive, echoing the character of the single family homes that originally formed the Tait neighbourhood. Inside, the Parc Riviera Richmond townhomes and apartment condos will not only provide you with every luxury, but offer you an uncommon standard value and convenience. The indoor living space includes eco-conscious, geothermal heating and cooling for around the year comfort indoors in addition to Energy Star appliances throughout the homes. In addition, the pre-construction Richmond Parc Riviera condos and riverfront townhouses will include beautiful quartz kitchen counters in addition to a professional stainless steel GE Café appliance set that includes a five burner dual fuel convection gas range with baking drawer, large fridge with bottom mounted freezer, French Door fridges with bottom mount freezer in select homes in addition to a Panasonic above the range microwave and hood fan combo. The kitchens in select floor plans at the Parc Riviera condos in Richmond real estate market will have breakfast bars in addition to Sonetto under mount sinks and Ricelieu kitchen organizers. Glass tiled backsplashes in addition to under cabinetry kitchen LED lights are also standard. The bathrooms at the luxury Parc Riviera Richmond riverfront condos will also include quartz counters, large format inspired porcelain tiled floors with polished accents in addition to American Standard undermount sinks, Maax soaker tubs and Taymore/Grohe bathroom fixtures. The living spaces in these amazing riverfront townhouses at Parc Riviera Richmond condos for sale will also have airy and over height nine foot ceilings in addition to hardwood floors throughout the dining/living rooms and cozy carpeting in the bedrooms. There are also roller blinds throughout for added privacy. Some sample Parc Riviera condo floor plans include Building E – Suite A which is a junior 2 bedroom with a suite area of approximately 736 to 765 square feet (with 2 bedrooms and U-shaped kitchen in addition to a large balcony and den/guest room) In addition, Building E- Suite G is a one bedroom suite Parc Riviera floor plan with one bathroom, linear kitchen, balcony and a suite area of about 617 square feet. No new Richmond Parc Riviera townhome plans have been released yet. The Parc Riviera Richmond riverfront real estate development team combines a passion for the community and comes with a reputation for creating outstanding neighbourhoods. This mater planned retreat represents the best of Dava Developments and Oris Consulting. Award winning Dava Developments is well established throughout Richmond, with a business philosophy founded on superior, sustainable design and exceptional craftsmanship, especially here at the new Richmond Parc Riviera condos and townhouses. Oris Consulting has been revitalizing urban neighbourhoods for over thirty years, with environmental sustainability one of their core values. You are in great hands here at the riverfront Parc Riviera Richmond condo development. Parc Riviera Richmond waterfront living offers a luxurious level of features and amenities at value conscious prices that makes it truly Richmond’s Best Riverfront Value. We would like to highlight for you just a few examples of the tremendous benefits that owners will enjoy. 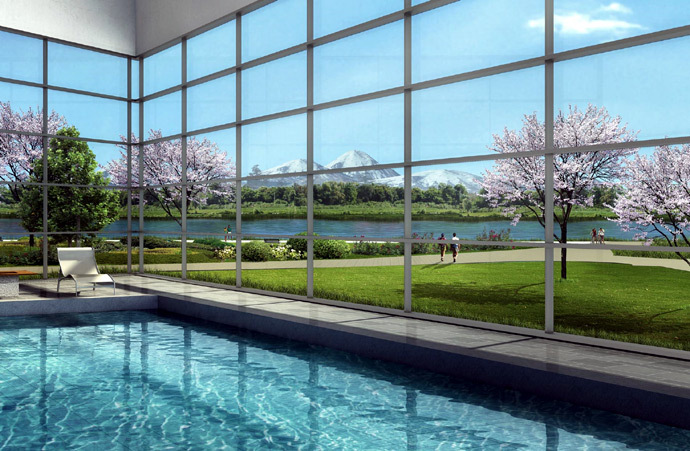 Geothermal A/C and Heating at Parc Riviera Richmond condos > Oris Consulting, developer for Parc Riviera Richmond waterfront condos for sale, is leading the charge in incorporating Geothermal A/C and Heating in projects all over Richmond. 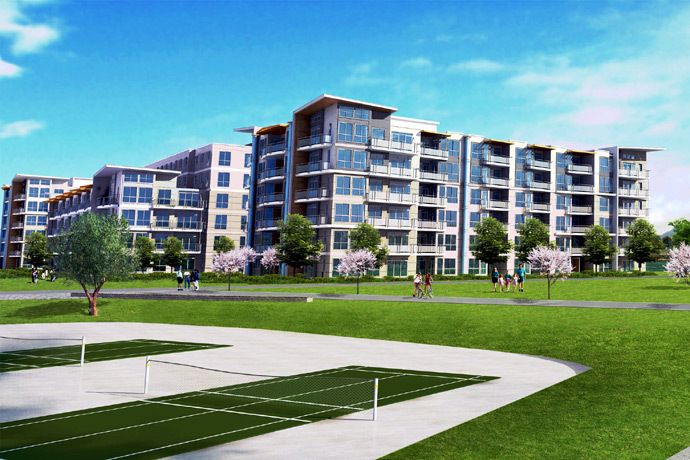 As the premier consultant in Geothermal technology, Oris brings an unparalleled level of expertise and experience to its own development at the preconstruction Richmond Parc Riviera condos that will benefit owners for years to come. Dana Westermark, President of Oris Consulting, explains: “Geothermal technology provides immediate and long-term economic benefits to owners. The trend now is to utilize sustainable and renewable energy sources such as Geothermal to provide heating and cooling to future homes. Parc Riviera Richmond condos is at the forefront of this transformation and will be one of the first in Richmond to reap the benefits.” Top of the Line GE Café Appliances at Parc Riviera Richmond condos along the riverfront > Every home at the new Richmond Parc Riviera project comes with a full array of premier stainless steel GE Café appliances. The GE Café brand is one of the top tier product lines by GE. Its features and finishes outperform those of its competitors such as Bosch and Kitchen-Aid. To demonstrate, here are a few of the special features that come with the Five Burner Dual-Fuel Range at the preconstruction Richmond Parc Riviera condo development: Five gas burners for chef inspired gas power and control – stir-fry like a chef, Central oval burner with non-stick griddle – great for making breakfast or searing fish, Electric convection oven for ideal temperature consistency – bake the perfect cake and An extra lower baking drawer gives you two ovens in one – broil and braise at the same time. Natural Setting – Gorgeous Views right here at the new Richmond Parc Riviera riverfront condos > You know by now that Parc Riviera Richmond real estate development offers convenient living in a natural setting with close to 5 acres of parks and greenspace, but did you know that almost ALL our condo SUITES have North Shore and River VIEWS? Great sightlines are achieved with the use of large park lands and landscaped areas between the new Richmond Parc Riviera condo buildings to offer gorgeous views for every home.